LONDON -- London's Metropolitan Police said Friday that the confirmed death toll from the devastating fire that tore through an apartment building earlier in the week had reached 30, but warned it was expected to climb still further. Police commander Stuart Cundy said all fires inside the building were out, and that inspectors where working in the location where the deadly blaze is believed to have started. He said there was no immediate evidence to suggest it had been started deliberately. Cundy said one of the victims died during treatment in hospital. 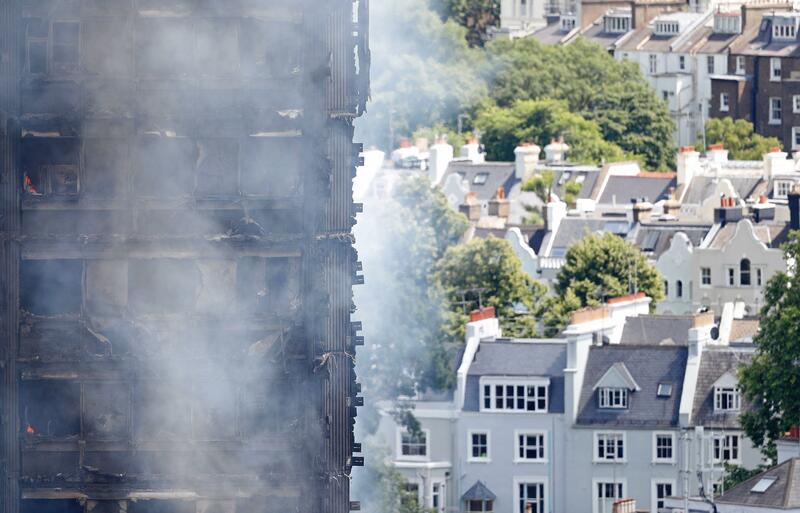 Did renovations play role in London high-rise fire? Relatives of those missing after a high-rise tower blaze in London posted pictures of their loved ones, meanwhile, in the desperate hope of news, as grief following the tragedy turned to outrage at authorities accused of being lax in meeting and enforcing building standards. Firefighters searching the smoldering ruin in west London have recovered six bodies from the 24-story Grenfell Tower, while 11 others have been located but cannot yet be removed from the gutted structure. The death toll is still expected to rise substantially. Families searching for their loved ones have blanketed the area near the tower with posters searching for answers, as attention turned to whether recent refurbishment on the building was done properly. The blaze ripped through the building early Wednesday, trapping many residents in their homes. "I do sense the anger," Conservative lawmaker Andrea Leadsom said as she faced the fury of local residents during a tour of the site. Residents and victims have expressed outrage at Prime Minister Theresa May, who visited the site the day before without meeting with local residents. While members of her party have suggested security issues contributed to her lack of engagement with the public, residents seemed unwilling to accept the explanation. "Meet the victims!" one person yelled as Leadsom was interviewed on Sky News. Another man pushed her for an answer on why, as part of a recent $11 million refurbishment, a sprinkler system wasn't installed in the building. Such a system would reportedly have cost approximately $254,000. The refurbishment, carried between 2015 and 2016, saw new external cladding installed on the building. It was part of a wider $73 million development of the extremely pricey Kensington neighborhood, which included the construction of new homes. Many fire experts have pointed to the cladding as a likely factor in how the fire spread so quickly up the 24-story building. Anger was certain to grow as other national leaders embarked on tours of the site and meetings with the afflicted. Queen Elizabeth II and Prince William visited an aid distribution site and were meeting with volunteers. The monarch has expressed her sympathies to families of victims of the blaze. Opposition leader Jeremy Corbyn came to the site Thursday and met with residents. Britain's Press Association reported that some 70 people were missing after compiling a list of verified reports. Authorities have not yet issued a figure and have said they genuinely don't know how many people might have died. Cundy, the police commander, repeated that on Friday, saying it was still impossible to give an accurate figure. Whole families are among the missing, including Bassem Choukeir, his wife Nadia, her mother Sariyya and the couple's three daughters Mirna, Fatmeh and Zaynab. They lived on the 22nd floor. London Police said an investigation had been launched to determine whether the blaze involved any crimes, and May announced a public inquiry, a type of probe that's used to investigate issues of major public concern. In addition, London Mayor Sadiq Khan called for an interim report on the fire to be published this summer. The tower is in the North Kensington neighborhood, a working-class, multi-ethnic area that adjoins some of the richest neighborhoods in Britain. Some observers asked whether hazards in the Grenfell complex, which had 120 apartments that housed as many as 600 people, were ignored because its residents are mainly poor. A tenants group had complained for years about the risk of a fire in the building, owned by the local government in the borough of Kensington and Chelsea. Fire safety engineers were stunned at how rapidly the fire spread, engulfing the building in less than an hour in the middle of the night and preventing firefighters from reaching many people inside. Some jumped to their deaths rather than face the flames, and witnesses reported seeing small children thrown from the tower by their families in a desperate bid to save them.